Earlier this year, in collaboration with Nipper Skipper, I designed a set of t-shirts based on their very cute logo-mascot Pip (Penguin) – They went on sale yesterday! Nipper Skipper sell sailing gear- safety gear and technical clothing for children who sail – age 0-10 years. 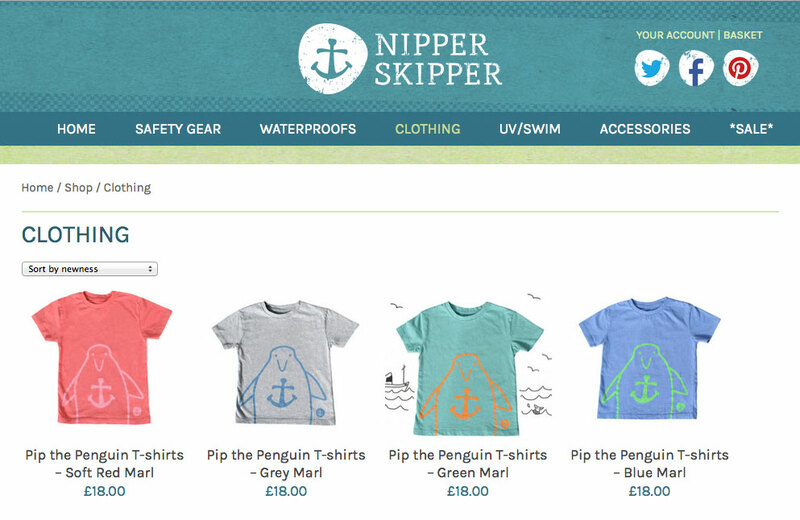 The t-shirts are their first foray into Nipper Skipper branded products. Rather than straight copy their Pip logo I went for a simplified, yet still very recognisable, strong line drawing of Pip. 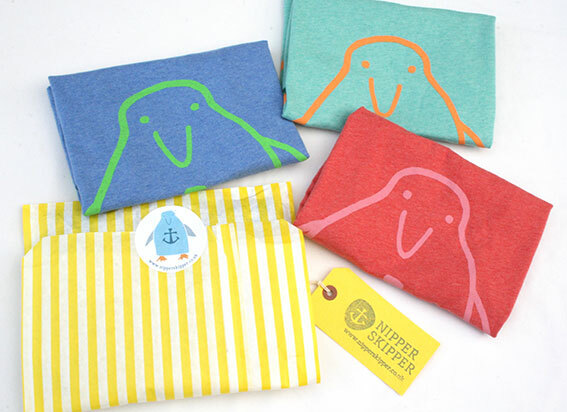 Nipper Skipper felt strongly that their customers would be keen on organic fair trade t-shirts. After some research we settled on Stella and Stanley marl shirts, printed by 3rd Rail in Bermondsey London, using water-based discharge inks – which give a fantastic soft feel (no horrible plastic finish) you can hardly feel any ink on it at all. Lastly, we thought about packaging. I’d had these gorgeous stripey candy bags on one of my Pinterest boards for ages, they come in a lovely range of colours and sizes. The yellow ones were perfect with the set of Pip stickers Nipper Skipper already send in their parcels. This entry was posted in News, Studio posts on April 8, 2015 by lisabenn.